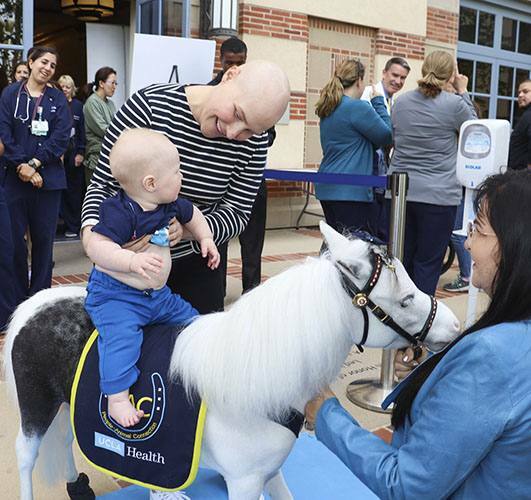 To celebrate her last day of chemotherapy, cancer patient Robin Reader got a special visit from Blue Moon, a mini-horse who is part of the UCLA Health People-Animal Connection program. Robin, who had a rare form of cancer, was diagnosed when she was 26 weeks pregnant. As a result, oncologists at UCLA Medical Center, Santa Monica, monitored her health closely for the rest of her pregnancy. 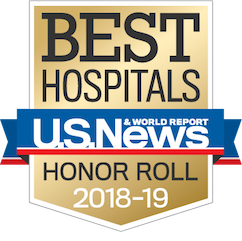 Just two weeks after she delivered a healthy boy, Robin began a nine-month period of cancer treatment that included surgery, radiation and chemotherapy. Our PAC therapy mini-horse, Blue Moon, was happy to trot over the hospital to give the family a memorable send-off – and entertain other patients and visitors who wandered into the garden.